There's not been a Let's Brew Wednesday recipe for a while. And I need to keep pushing my book*. Not had a recipe from Kristen in a while, so this one of my efforts. (The recipe is for 6 US or 5 Imperial gallons. I forgot to mention that in the book.) It's one of the recipes I had to cut for space reasons. But it's also that most trendy of beasts: a session IPA. 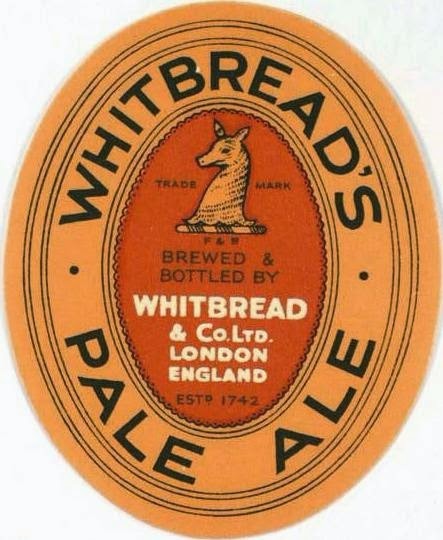 Whitbread's IPA didn't have a long history at this point. It was first brewed in September 1899**, whereas their PA had been around since 1867. 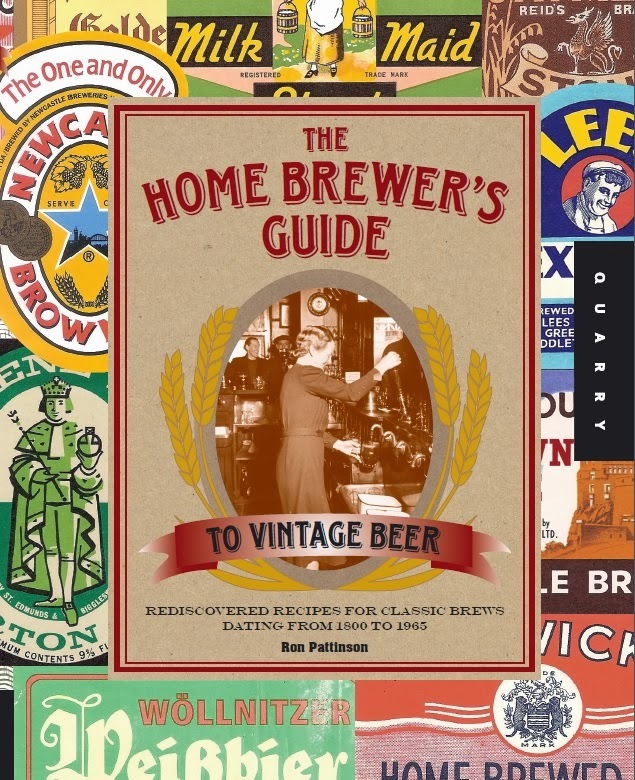 And that wasn't the only Pale Ale that predated IPA, Family Ale was first brewed in 1871 and 2PA in 1888. IPA was late to the party. Let's make this plain: it always had a lower gravity than the Pale Ale. Usually 10 to 13 gravity points lower. Another point worth making is that these two beers weren't usually parti-gyled. The only example in the tables below is the PA from the 10th May 1922. That was parti-gyled with IPA, which explains the heavier rate of hopping. Originally, PA and IPA were both hopped at around 12 lbs per quarter. Then in 1908 the rate for PA was cut to 9 lbs per quarter, but for IPA to 11 lbs. From this point on, the IPA, relative to gravity, was more heavily hopped than the PA. I think that's quite significant. With getting on for 2 lbs per barrel of hops in a beer with a gravity in the mid-1030's, the 1920's version must have tasted pretty bitter. Especially given the high degree of attenuation. Whitbread brewing records held at the London Metropolitan Archives, document numbers LMA/4453/D/01/065, LMA/4453/D/01/067, LMA/4453/D/01/069, LMA/4453/D/01/070, LMA/4453/D/01/071, LMA/4453/D/01/072, LMA/4453/D/01/073, LMA/4453/D/01/075, LMA/4453/D/01/076, LMA/4453/D/01/077, LMA/4453/D/01/078, LMA/4453/D/01/080, LMA/4453/D/01/081, LMA/4453/D/01/083, LMA/4453/D/01/085, LMA/4453/D/01/086, LMA/4453/D/01/087, LMA/4453/D/01/088. Whitbread brewing records held at the London Metropolitan Archives, document numbers LMA/4453/D/01/067, LMA/4453/D/01/068, LMA/4453/D/01/069, LMA/4453/D/01/070, LMA/4453/D/01/071, LMA/4453/D/01/072, LMA/4453/D/01/073, LMA/4453/D/01/074, LMA/4453/D/01/076, LMA/4453/D/01/077, LMA/4453/D/01/078, LMA/4453/D/01/080, LMA/4453/D/01/081, LMA/4453/D/01/083, LMA/4453/D/01/085, LMA/4453/D/01/086, LMA/4453/D/01/087, LMA/4453/D/01/088. How would 1923 Whitbread IPA compare to a modern Session IPA? I'm not sure. It's weaker than most contemporary versions, that's for sure. And uses different hops. I guess someone will need to brew it for us to find out. Best give the recipe, then. Whitbread brewing record held at the London Metropolitan Archives, document number LMA/4453/D/01/088. It's pretty damn simple: 2-row and 6-row pale malt, No. 1 invert sugar, Fuggles and Goldings. Not the complete absence of crystal malt. As I keep telling you, it wasn't really that common in British Bitters until after WW I. There was probably also some caramel added for colour adjustment, even though it is fairly pale in colour. ** Whitbread brewing record held at the London Metropolitan Archives, document number LMA/4453/D/01/065. *** Whitbread brewing record held at the London Metropolitan Archives, document number LMA/4453/D/01/088. Would this beer have also been dry hopped? yes, but the Whitbread records don't include dry-hopping details. Hi I just wanted to check in here and give my report having brewed and now drank this beer. My first brew from the SUABP recipes, I used Maris Otter, 6-row, and Golden Syrup, while scaling the EKG down a touch to compensate for the higher AAU in what I had. I fermented with WLP007 and dry hopped for 5 days with about a half oz of EKG. Both my efficiency and attenuation were over target (I'm still dialling in my current setup), giving a beer up about 5% abv but the result is lovely: definitely quaffable and more-ish. Thanks for the recipe! sounds like it turned out really nice. I've heard several good reports of the lightish Bitters from between the wars. They seem to be good drinking beers. Didn't a blogger just publish a book?